Looking for ideas! Over the past two years the Dynon ads in Kitplanes and Sport Aviation have highlighted the experimental and LSA aircraft of our customers. The most recent ad features Stephen Christopher’s RV-7 doing what he does… flying upside down. He is local to us so the background (with artistic license) is Seattle. I'm running out of ideas. Do you have any good ideas for nice planes and backdrops to feature? Previous backgrounds included Seattle, Florida, France, Brazil, Hawaii, Switzerland, Yosemite, Utah, and Oshkosh. This isn’t really a contest, but if you have a nice photo of your experimental or LSA plane, along with a suggestion for a cool background, you might see your plane featured in an ad. (The location can be some place you've flown, or just wish you had flown!) If I use your idea you will get your plane in print and a really nice custom made poster to hang in your hangar. 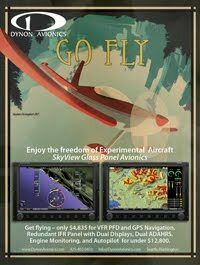 If you have a photo and idea, email them to me at robert.hamilton(at)dynonavionics.com.